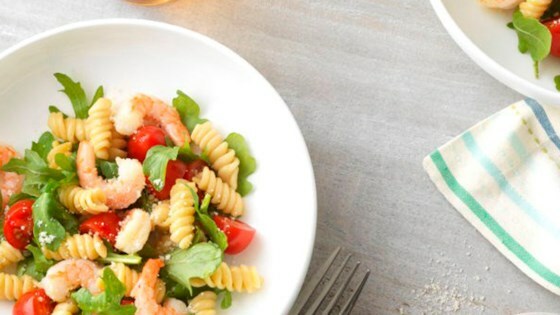 "This shrimp and arugula rotini is made with Ready Pasta for the perfect quick and easy weeknight dinner for two." In a large skillet, heat the olive oil over medium heat then add the shrimp and cook on both sides until opaque, about five minutes. Add the arugula and tomatoes, season with salt and pepper, and cook for one minute. Tear corner of Ready Pasta pouch to vent. Heat in the microwave for one minute, then combine with the shrimp and top with cheese. Serve and enjoy.